Since its establishment in 1957, IMV has been deeply involved in research and development in the field of dynamics, especially vibration engineering. 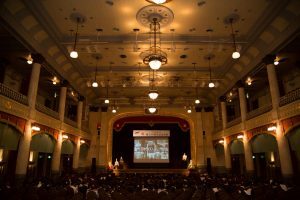 IMV welcomes 60th anniversary this year since establishment in 1957, we have organized our 60th anniversary ceremony at Osaka City Central Public Hall. The weather was rainy, however total 300 members from IMV group (Tokyo, Osaka, Nagoya, Thailand U.S. U.K. China) has joined. The theme of our 60th anniversary took the name “Make A Wish” hoping that our employee will make their own wish come true through working in IMV. 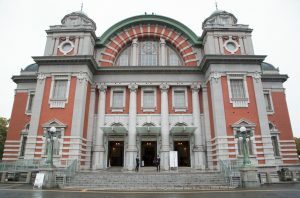 The hall is very famous place in Osaka, the founder wished he could build great public halls like Carnegie Hall back then. Building the public hall really was his “Make A Wish”. Holding our anniversary ceremony in the historic building is such an honor for us and this event became an unforgettable memory in my life. We have started preparation from spring this year. We have made memorial leaflet which introduces the wishes and pictures of IMV family. 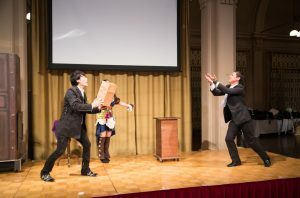 Young members entertained the ceremony with dance and quiz games, and magic show so everyone enjoyed it so much. Thanks you so much for great support. Congratulations IMV’s happy birthday! Looking forward to our next 100th anniversary.